McCallum High School was well represented on the opening day for High School Athletes to sign National Letters of Intent. Paul Tearson, Audra Randell, Marcus Mann, and Evan Woody signed their names on the dotted lines to further their athletic and academic pursuits at the college level. 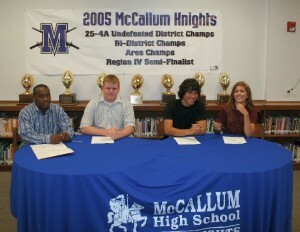 Three of the athletes played on McCallum’s District Championship Football teams over the past several seasons. Marcus Mann and Evan Woody will continue in football, while Paul Tearson and Audra Randell will play in the soccer arena.The four athletes along with their families and supporters met at McCallum’s Library on February 7th for the signing ceremony. Paul Tearson, who was the Knights’ outstanding kicker and safety, will play soccer for the Crusaders at the College of Holy Cross in Boston, MA. Audra Randell, who played for the Knights girls’ soccer team signed on to play for the Bobcats at Texas State in San Marcos, TX. Marcus Mann, McCallum’s high-powered running back last season will ply his trade for the Cardinals at Trinity Valley Community College in Athens, TX. Marcus will be following another McCallum alum, Ben McMahan, by playing for the Cardinals. Evan Woody, who was one of the pillars on McCallum’s strong offensive line, will travel north and play football for the Colorado School of Mines in Golden CO, along with pursuing an engineering degree. Paul Tearson, Marcus Mann, Evan Woody along with another fellow teammate from McCallum, Jared Alexander, have been picked to play for the South All-Stars in the Lone Star Classic All-Star game Friday February 23rd, at the Frank Erwin Center in Austin. Congratulations and thanks to these young men and woman on their accomplishments over the past years at McCallum, and good luck to them all on their next step in their careers and lives.